Among the top 3 most desired muscles, the chest muscles undoubtedly take 1st place. No muscle displays such masculinity as a strong and defined “Major.” This muscle is adored by women and commands respect and recognition from all..
Back training is important! Long meetings in the office, hours in front of the computer, stress in the family - for many people the stress of everyday life unfolds in joint and back pain. Most experience the pain in their cross section however, complaints of the shoulder and lumbar region are widespread. Hardly any part of the body is so admired as the six pack of a man – for both sexes alike! The six pack is the final refining stage and THE symbol of male fitness. The condition of the midsection can be easily read as how important sport, appearance and health for that person is. Do sore and aching muscles have you limping the day after an intense training session? It is well known that stretching plays a vital role in the rejuvenation and quality of your workout. This guide will help distinguish two types of stretching and lay focus on the sustainable health benefits of post-workout stretching. Your 4 week bikini body workout plan - The road to your bikini body usually contains regular aerobic exercise which can melt the pounds away. A perfect workout for this is cardio training on an Elliptical Cross Trainer. With our fitness equipment we offer you the chance to get in to shape this summer. A super six pack, a muscular chest and fully trained body; we encourage you to train with a single piece of equipment a Multi Gym. A flat stomach is the modern day idea of beauty. Both men and women push for a slim silhouette following a flat stomach or six pack abs; you can read extensively about fitness, dynamics and body awareness. Mindful Training is More Effective! It is made almost too easy to plug out of life and tune in to your new music or to your favourite TV show while at the gym or working out. And why shouldn't you? We know that music and other distractions can help a lot of us when it comes to working out. Distracting our minds from the present is not only cause for a poor quality workout but can lead to heightened stress levels and fatigue. Taut thighs and a narrow waist top the wish list for women this summer. Through various methods and types of exercise like continuous aerobic training this desire must be no illusion. "High Intensity Interval Training" and "low intensity steady state training" are two fundamentally different training methods. But which method is better? And how do they differ? Found out here. For visually impressive upper arms, the main attention should be paid to the triceps. Even though the common belief is that big biceps make for impressive arms. This is achieved only through a massive triceps. The triceps alone makes up for two thirds of the mass / size of the upper arm, the much smaller biceps the other third. You want to be slender, look better and live a healthier longer life? Then you need to reduce the bodies’ fat reserves. How to stay healthy this cold and flu season? Finding a cure for the common cold may seem like a elusive goal, but there are some simple ways to improve your chances of beating the virus this winter season. We´ll tell you what you can do to avoid falling victim to the annual runny nose and sore throat and how you can stay healthy all winter long. Our stomach is composed of different abdominal muscles: the straight, the oblique and transverse abdominal muscles. With a good abdominal workout the entire abdomen is involved and invigorated. Athletic training is fun and keeps you healthy. The only problem is to keep the training regular. With the demands of modern life, both business and pleasure, fitting in regular fitness training session is difficult to achieve. 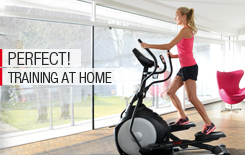 But with the right home exercise equipment a flexible workout for the entire body is possible at any time!